Updated: A Chicago-based media startup called Journatic, which we profiled earlier this year, has sparked a firestorm of controversy over the outsourcing of hyper-local journalism by newspapers such as the Chicago Tribune, after a staffer revealed that the company added fake bylines to its material — which in some cases is compiled by freelancers in other countries. A number of the startup’s clients have dropped the service as a result, while others are trying to essentially recreate it within their newsrooms. But despite the furor over what some see as Journatic’s unethical methods, the harsh reality is that the economic conditions that led the Tribune and others to make use of the service are not going away any time soon. As we described in our post — which was based on an interview with Journatic founder and former journalist Brian Timpone — the service uses freelancers and staff to compile the kind of local news that typically appears in weekly community newspapers or the local section of a daily like the Tribune: that is, announcements about local sporting events, residents who have won awards, council meetings and so on. In many cases, the content is produced by a local staffer who pulls information from a database or website (or in some cases calls a local business) along with freelancers who work in the Philippines and elsewhere, and are paid either an hourly rate or on a per-piece basis. Accelerating the death of newspapers or adapting to it? I felt like the company I was working for was accelerating the death of the newspaper, luring many members of the industry into their own demise with the promise of short-term savings. This week, many of the newspapers that were working with Journatic said they have severed that relationship, including the Chicago Sun-Times and a number of papers owned by the GateHouse chain. A spokesman for GateHouse told Poynter that the newspaper company is working on a project that will more or less duplicate what Journatic was doing, by centralizing the production of local community news for the entire chain — and also said that the service didn’t really achieve what GateHouse hoped it would, which was to free up staff to take on more in-depth journalistic pursuits. 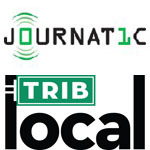 Much of the reaction to the Journatic story has focused on how the fake bylines — and the way reporters described who they were in phone interviews — were designed to simulate hyper-local content, and how this is an unethical or at least unappealing thing for newspapers to do (although some have pointed out that newspapers have always used content that appears with “fake” bylines, including advice columns such as Ann Landers). Mandy Jenkins, who works at Digital First Media and writes a blog called Zombie Journalism, said that readers should demand locally-produced content from their newspapers as part of a “Buy Local” campaign. The uncomfortable reality, however, is that the Tribune and other newspapers started using Journatic because it was a lot cheaper than generating that kind of content with staff reporters, and newspapers have been scrambling to cut costs as their print-advertising revenue continues to free fall. The Tribune, for example, laid off 22 employees when it outsourced its hyper-local content to Journatic — and while GateHouse says it plans to create similar content in-house, it is still centralizing the production of that content somewhere else (although it may be closer than the Philippines). Even AOL, which has tried hard to recreate some of the community-newspaper model with its Patch network of local bloggers and reporters, has found that the costs of doing this are almost prohibitive (it has spent over $150 million so far) and the advertising revenue that it derives from those operations is barely worth the trouble. Local bloggers — who have a much more personal connection to their audience — can fill some of the gap, but that is likely to be more of a labor of love than a commercial enterprise. Is faking hyper-local content the answer? Probably not. But it’s also true that most newspapers can’t afford to continue producing a lot of the kind of content that Journatic generated. The fake-byline issue is a bit of a red herring in that sense: while it would be nice to think that a “Buy Local” campaign would convince newspapers to devote more resources to it, the fact is that most people don’t buy that kind of content at all. And the newspapers that outsourced it wanted to do so in part so they could (theoretically at least) concentrate on more important journalism, although whether they actually do so or not remains to be seen. Update: In a phone and email conversation after this post was published, Brian Timpone said that the Journatic contracts with both GateHouse and the Chicago Sun-Times had already expired before the fake-byline report came out, and that only one client has dropped the service because of the report. He also said that fabricated names were only ever used for BlockShopper real-estate listings, and that most of these were created in 2009 and was given to newspapers as a placeholder until more local content could be created. The Journatic founder said the decision not to remove these fake bylines was “absolutely a mistake” and that the company is changing its process so that doesn’t happen again — and also to prevent writers from using pseudonyms, which happened with some Journatic stories from one writer that ran in the San Francisco Chronicle. Keep lying, Timpone. You’re only making it worse for yourself. You’re another Geoff Doughtery. Turn the topic around slightly and consider how many reporters simply go on the internet and read, copy and maybe change a few words, or interject, and call it a story using their legit byline. I don’t find that impressive. 99.99% of the text media on the internet is echo journalism – they just took it form somewhere else, and slapped their name on it. Yawn! As an addendum to my previous comment I should have added ‘true’. Bias has always existed in journalism, but the lack of veracity of much of what is reported these days is what I find most troubling, not that some outsourcer is doing the writing. In an ironic way, an outsourcer could be constrained to the facts because they don’t have the same vested interest in marketing the newspaper/news network. For instance, I’m sure people recognize most of the news journalists you see on TV were chosen for their looks, not their journalist experience and integrity. No, I am never going to accept outsourcing of information gathering not knowing where or who it comes from. Particularly when bylines are faked. If this has to be done to “save” journalism then the hell with it, I’ll read a good book. Oh, and those local bloggers who are toiling on “labors of love” and can’t be counted on. They have a trade group now: http://www.lion publishers.com. And some have been making money for quite some time. Finally let us not forget that commercial media is not the only type of media there is. There is public media, nonprofit media and various hybrids. So let’s not pretend that its giant monolithic news org or nothing. All of the people whining about this are people who have a vested interest in journalists losing jobs. it is plain and simply guild proetectionism. If the work Journatic is doing is of poor quality, fine, then talk about *that*. But it is hardly “unethical” to make a more efficient process that might disrupt local journalism. In fact, from a utilitatrian ethical standpoint, it is unethical *not* to do things more efficiently. With reagrd to “fake” bylines – you linked to the guy who nailed it. The entire web is built out of finding loopholes (scaling up pen names in theis case) and running with them. And the staffer, Ryan, seem pretty focused on the effects on the jobs of journalists in his attacks on his employer, instead of making a good case for his betrayal regarding anything to do with the resultant content. I think bashing your employer and walking through proprietary systems to purposefully damage their reputation with an outside entity is far FAR more unethical than anything Journatic is being accused of here. Being accused of breaking “Journalism ethics” is hardly grounds for calling someone “unethical”, too (one guy on Twitter even called it “fraud” which is, in my mind actually libelous). The mix of poisonous narrative hit piece, protectionist Luddism and manufacturing malfeasance where its, at worst, there’s some marketing is worth questioning here. Nice piece and well balanced, especially given the “scandal” mongering elsewhere. As long as the content is well-written and relevant to the locals, I just don’t see the problem. I think folk need to understand the real state of journalism the world over at the moment. Not only is it concentrated in the hands of a pitifully few owners, but the practice of outsourcing content has now almost consumed ‘real’ in-house content for most magazines and newspapers. The outsourcing is mainly going to agencies such as PA (Press Association) and others, and the content is being produced by contract freelancers on a daily basis. This is the reality of ‘new journalism’ in the age of the Internet and it’s not going to go away, so we must learn to live with it. What Journatic offers may be attractive to metropolitan-scale newspaper publishers in the short run, but it addresses only one of the five newspaper publishing activities that cable television, the Internet, and mobile phones have disrupted irrevocably: information-gathering and -editing (the others being physical distribution of printed newspapers and ad inserts, sale of subscriptions for home delivery, sale of classified ads, and sale of display ads). The coincidence that, for at least the first 60 of the last 75 years, all five of those distinct activities could be efficiently organized at the same (roughly metropolitan) geographic scale and (roughly daily) temporal scale led many people to assume that the traditional business model of metropolitan daily newspapers was some sort of Law of Nature. Outsourcing some information-gathering to Journatic permits publishers to cut their costs somewhat, but it merely postpones the thorough rethinking of both the geographic scope and the frequency of their coverage that is inevitable at some point. Carving out zoned editions, undertaking hyperlocal initiatives, outsourcing (or simply omitting) copy-editing, dropping peripheral circulation areas, printing newspapers on only a few days of the weekâ€”or not at all, and erecting digital paywalls are all aimed at trying to regain some of the congruence of time and geography that made metropolitan dailies so profitable (especially when many were monopolies or near-monopolies). Too often, though, they seem to be desperate attempts at first-aid, not parts of a serious strategy to winnow a sustainable business (or businesses) out of the mounting carnage. Totally agree, Ted — many of these kinds of moves by newspapers seem like a Band-Aid type of situation. Thanks for the comment. You say the content is produced by “a local staffer” in many cases. Maybe I’m misreading, but the content is almost never produced by a local staffer, if ever. That’s what Mandy Jenkins and others who share her view feel is problematic. You say financial realities prompt newspapers to do this. But a recent Pew report showed that most newspapers are still profitable. The ugly truth is in how they choose to allocate their resources. I would like to see, for every company that uses Journatic, how much they’re paying middle managers, name columnists, how much their building costs, how many bonuses they give out, how much execs spent on travel expenses and fancy dinners, etc, etc. Obviously Tribune isn’t profitable as they are in bankruptcy. But they didn’t have to get into the local news biz. They did it for the local ad dollars, like they told TAL and then found oh darn, reporters can’t churn out enough content so there’s not enough traffic so they won’t be able to sell many ads. So yes, now there’s some “coverage” of communities where there wasn’t before. But if you put a McDonalds in a food desert, is that really better for the community? The communities information needs are what’s sadly absent from this discussion. Never mind about substantively informing people, we just want more content, right? Wrong. And to suggest that news organizations are doing it because they don’t have two nickels to rub together instead of out of craven self-interest? That’s wrong too. I would agree that seems to be a root problem. I live in Austin (Texas state capital) and our local TV news is commonly about apartment fires and traffic accidents. I stopped reading the newspaper long ago. Frankly, if a person in another country monitored the State house video feed online and summarized the key points for local residents each day, it would be more meaningful than the mainstream media coverage of local events that effect the community. Thanks for the comment, Anna. I guess “local staffer” might not be the right term — I meant someone other than a person in the Philippines or some far-off location. That was a poor choice of words. And you are quite right that this is all about the way that newspapers like the Tribune choose to apportion costs and resources. I’m not defending their decisions — I’m just saying that they have to make choices about what to cover, and how to do so. Does that mean Journatic or Narrative Science are the only options? No. But I think plenty of people would argue that the kind of news Journatic produces is just not a cost-efficient use of resources for a newspaper in an economic environment like we are in now. We may wish it was, but that doesn’t make it so. Reblogged this on Marcus Sanford.